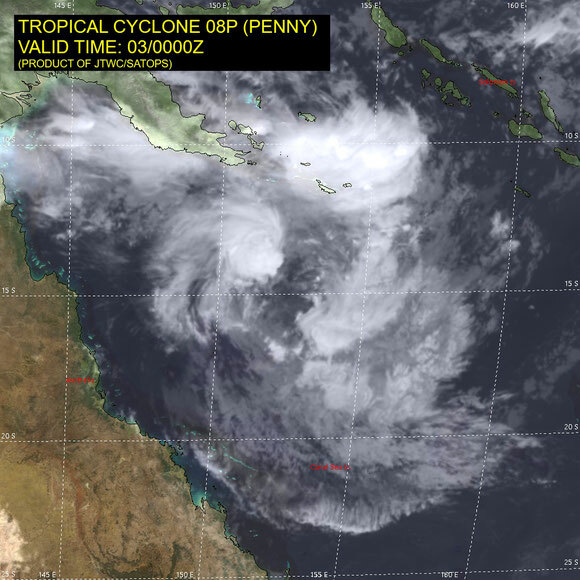 Tropical Cyclone Penny re-formed in the Coral Sea. 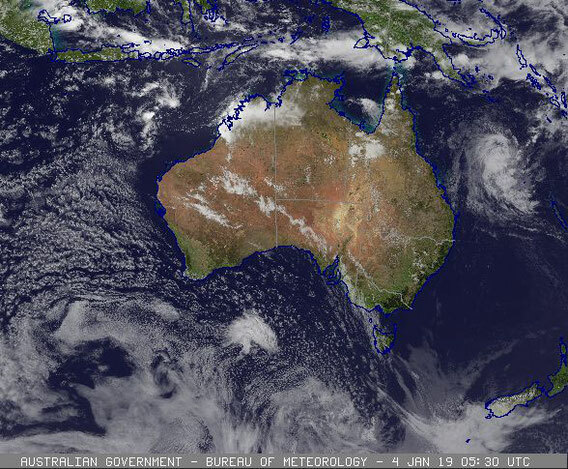 The second cyclone to develop in the Australian region in the 2018-19 season has been named Penny. 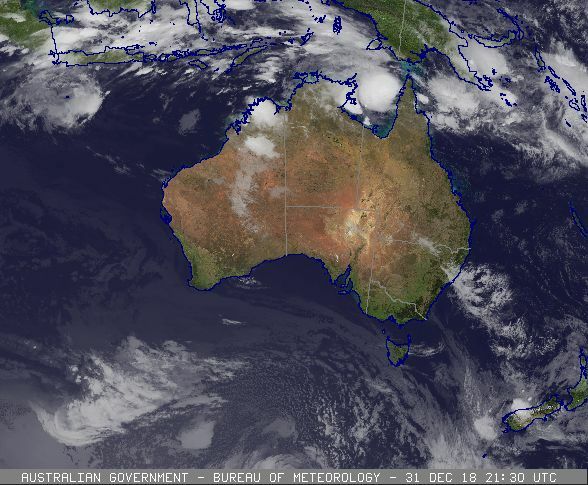 TC Penny formed at around 7am on new years day 2019 in the Gulf of Carpentaria. Penny developed into a category 2 cyclone while moving towards the eastern side of the gulf and making landfall just south of Weipa at around 10am. The system was degraded to a tropical low, while moving over Cape Yorke Peninsular and into the Coral Sea. Ex-TC Penny continued to move Eastward while the conditions for re-genesis became favorable. At around 4pm on 2 January 2019 Tropical Cyclone returned to life (reformed) and continued moved towards the South East as.a category 2 cyclone. Penny turned back towards the Queensland coast, conditions were not favorable for further devlopement. Track map of Tropical Cyclone Penny 03 December 2019. From JTWC. Satellite image of (zombie) Tropical Cyclone Penny (1300 AEST 03 Dec 2019). Image from JTWC. 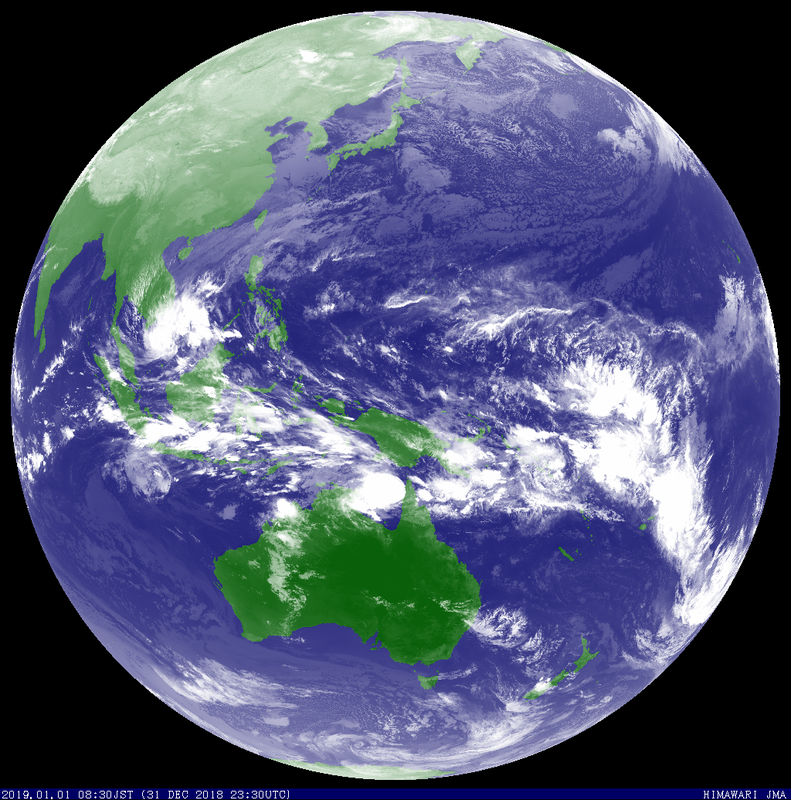 Satellite image of Tropical Cyclone Penny prior to being named (0400 AEST 01 Dec 2019). Image from JTWC. Satellite image of Tropical Cyclone Penny prior to being named (0530 AEST 01 Dec 2019). Image from www.bom.gov.au. Satellite image of Tropical Cyclone Penny 0930 AEST 01 Dec 2019. Image from JMA. Location: within 35 kilometres of 12.7 degrees South, 140.9 degrees East , 110 kilometres west of Weipa and 115 kilometres northwest of Aurukun . Movement: east southeast at 8 kilometres per hour . 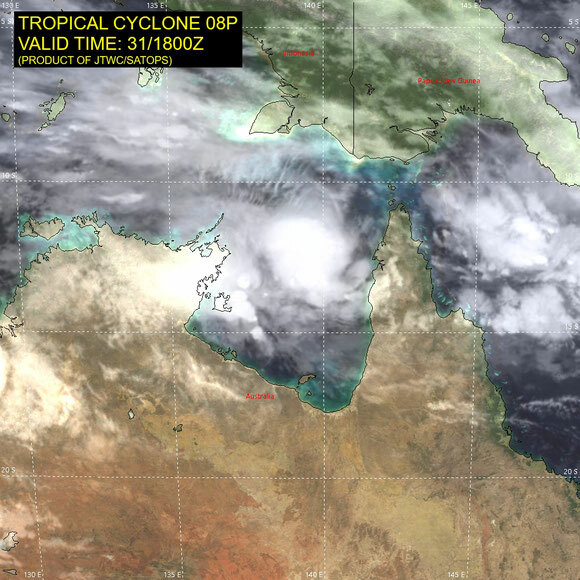 Tropical cyclone Penny has formed in the eastern Gulf of Carpentaria. Penny is expected to move east towards Cape York Peninsula and cross the coast near Weipa this afternoon as a category 1 system. The cyclone may reach category 2 if it moves slower than expected and spends more time over water. GALES, with peak gusts in excess of 90km/h, are occurring on the western Cape York Peninsula coast between Mapoon and Aurukun, and may extend to remaining areas between Cape York and Pormpuraaw later today. Isolated damaging wind gusts may occur otherwise with monsoonal thunderstorms over the Torres Strait Islands, and a separate Severe Weather Warning is current for these conditions. HEAVY RAINFALL, which may lead to flash flooding, is likely across Cape York Peninsula and parts of the North Tropical Coast today and Wednesday. A Flood Watch remains current for coastal catchments north of Cardwell, including catchments across the Cape York Peninsula. A separate Severe Weather Warning is also current for rainfall on the northeast tropical coast. TIDES will be higher than normal through Torres Strait and along the northwest Cape York Peninsula over the next couple of days. As the cyclone approaches the coast, a storm tide is expected between Cape York and Cape Keerweer. Large waves may produce minor flooding along the foreshore. People living in areas likely to be affected by this flooding should take measures to protect their property as much as possible and be prepared to help their neighbours. Gulf of Carpentaria and Coral Sea. 0.3 wrap. MET=1.5, adjusted to 2.0 by pattern. over the Coral Sea later this week.